Annabel’s in Mayfair, not to do anything by halves, celebrated Valentines Day in style this year with a selection of beautiful floral displays. They chose to have luxurious pink Secret Garden roses, with red Heart roses amongst a selection of beautifully scented David Austin roses. The colour combination set the mood off perfectly for the 2 heart shaped arches welcoming club members inside, and through to their beautiful garden room. And not to forget Annabel’s famous Gorilla, who was also suitably dressed for the occasion. We were thrilled to create these beautiful displays with the talented events team. It was so exciting being at The Ned this Christmas to decorate, and add even more glamour to our favourite London hotel. The 20ft Christmas tree, placed in the exuberant hotel lobby shone from within. Using over 900 hand picked decorations, in shades of bronze and gold the tree looked decadent and luxurious. The stunning garlands were a beautiful addition to the imposing entrances of the Ned, and welcomed guests with a festive feeling. We also added splashes of gold and gave all the floral arrangements around the hotel a christmas feel. Across town we were also busy helping to create one of the biggest Christmas trees in town at Annabel’s in Mayfair. Working with the immensely talented team at S2, we turned the Annabel’s Facade into a gigantic, magical tree which lit up Berkley Square beautifully. The giant candy canes, thousands of lights and oversized gifts finished the tree perfectly and ensured, from wherever you were standing, it couldn’t be missed. The Grandirosa team pulled off it's largest event to date at the end of August with the first Annabel's Jungle Party held at it's stunning new venue in Berkeley Square. We worked with three production studios to create a spectacular evening for their valued private members. A star studded crowd descended upon the private members club in Mayfair where they were greeted by humans dressed as monkeys abseiling off of the all-natural foliage and flower facade our team built, cheekily throwing plastic bananas at passers by. The fun did not stop there! Acrobats in full jungle costume descending down the six flights of stairs on natural garlanding in the main stairwell. We also decorated the whole walkway of the stairwell with a stunning display of tropical flowers. The Garden Room was totally transformed into a tropical paradise where Rita Ora surprised the audience with an incredible performance on a custom-built stage that we decorated with clusters of bananas, monkey vine, lotus pods, tropical leaves and spanish moss. The Rose Room was converted into a luscious floral wonderland with heliconia, bromeliad, antherium and tropical leaves popping out of almost every nook and cranny. The Elephant Room had an intricate hand carved elephant crashing through the wall into a more African inspired jungle theme of flowers and foliage, where we used lots of grasses and dried flowers to achieve the desired look. Congratulations to Annabel's on a roaring success, we are sure there will be many more to come and a big thank you so much to our incredible team of freelancers and to Pollen Crew for all your hard work. Luciana & Tim chose the truly breathtaking Bocconoc Estate in Cornwall for their summer wedding. In the height of the heatwave the estate was in its full glory with its rolling hills, surrounding forest and impressive stately home. It was the perfect backdrop for a spectacular wedding. Luciana’s floral brief was romantic and elegant, which matched the venue perfectly. The tonal palette the couple selected was blush pinks, berry purples, milky whites and greens. We achieved this look by using blousey garden roses and peonies, showstopper Cafe Au Lait dahlias and champagne lisianthus all set off with pops of plum coloured seasonal flowers and foliage. For the ceremony, we created a stunning demi arch at the entrance to the Boconoc Church to welcome their guests and added little meadow aisles lining the walkway with one large urn arrangement at the front which Luciana and Tim said their 'I do's' in front of. The reception took place at Boconnoc House where guests were treated to an evening of fabulous flowers, food and music. We created a beautiful urn arrangement welcoming guests on arrival. 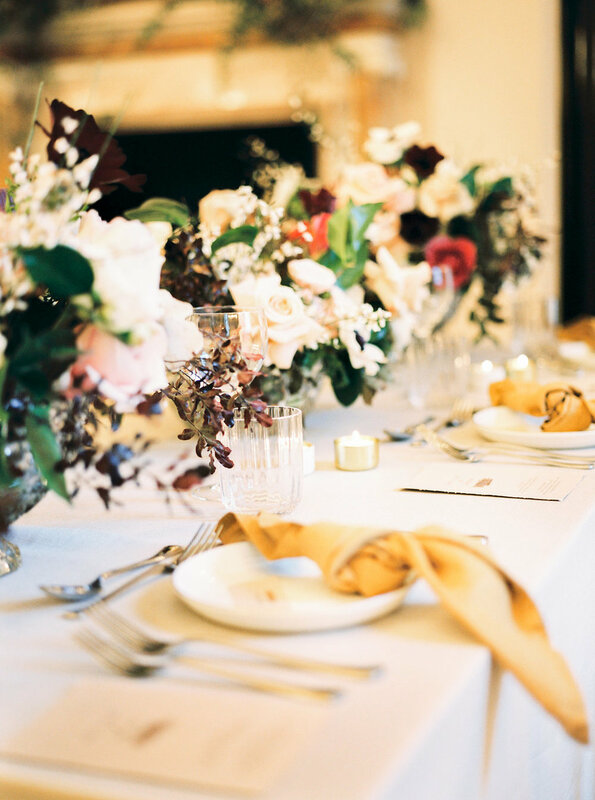 We added over 100 crystal cut vases in clusters with flowers from the couples chosen colour palette and tapered plum coloured candles in gold holders to add drama to the long U-shaped feasting table. And a beautiful urn arrangement for guests to enjoy on arrival. Above the fireplace our team also created a dramatic floral display which wowed guests in the drawing room. Thank you so much to Luciana and Tim for asking us to be a part of their special day and for inviting us down to Cornwall. We always love an away wedding! If you’re looking for sincerely special and unique wedding venue we couldn’t recommend Boconnoc highly enough! Celebrating 10 years of a wonderful partnership. Investec - Epsom Derby. It was really exciting to be part of dressing the hospitality suite for this year's Investec - Epsom Derby. To mark this landmark anniversary between these 2 amazing institutions the Creative Team at Investec worked closely with the brilliant production agency, Detail, transforming the Epsom Racecourse Suite into a slick and high-end space for guests to enjoy. The amazing production featured luxury textured finishes in marble, velvets and rose-gold metallics. The Luxurious furniture, unique lighting and props, dressed the space beautifully. The suite was divided into 3 sections with differentiated colour schemes. Bold and blue, natural and green, and finally, blush and rose golds. It was our job to add the finishing touches in florals. For the blue, we selected the best early summer flowers such a blue delphiniums and white peonies. Adding in some gorgeous hydrangea for boldness. Creating low and high arrangements for the tables and main bar top. The green section featured terrariums full of ferns and succulents, urns with flowing greenery and nestled white flowers for a natural flowing feel. Finally, the blush and rose gold section was our favourite. Using white O’hara, Secret Garden and classic Sweet Avalanche roses we packed the tables full of these with huge spayed palm leaves for impact. Behind the blush bar we created a beautiful growing rose wall, not forgetting the statement sprayed palms. Congratulations to the team for creating such a brilliant space for their guests to enjoy this iconic race. Here’s to next year!! Having recently started working with the amazing new Annabel's in Mayfair, we were thrilled to be asked to style their notorious members-only Greek brunch held in their magical Garden every Sunday in the early summer. In true Annabel's style, the brunch was an all-out extravaganza complete with live music and entertainers, delicious gourmet Greek food and even a few live goats thrown in for good measure. We knew we had to put on our Greek game faces and deliver a superbly styled event- and did just that! We took inspiration from our collective summer holidays spent on various islands in Greece. Over-spilling bows of lemons, lavender and rosemary plants in 'Santorini blue' pots, Greek statues and marvellous mantle displays featuring vibernum guelder and olive in blue and white greek style vessels were the order of the day. Opa! On Tuesday 17 April, Grandirosa created a blossoming affair at Venue Lab’s incredible space at 38 Grovesnor Square, Mayfair, for Net-a-Porter’s AW Trend Presentation, organised by the amazing Redhouse Production. Catching the last of the Mount Fuji blossom, it was a final nod to a wonderful early Spring and a warm welcome to the long anticipated summer. The venue is the old Indonesian Embassy and was the perfect backdrop to such a stylish event. A dramatic entrance arrangement consisting solely of gigantic branches of white blossom acted as a stylish welcome to Net-a-Porter's fashionable guests. This simple and sleek theme ran throughout the rest of the venue, from blossom and spirea arrangements in the pop-up Net-a-Porter cafe to the showroom. Over the past year we have been creating flowers for weddings and events at The Ned so it was great to be involved with their first wedding showcase back in January, it was an opportunity to really show off the beautiful rooms available at The Ned for a very special day. The event brought together selected suppliers from across the wedding industry with The Ned’s in-house events team. The day was styled by Jessie Sorores from Studio Sorores, there were beautifully set tables dressed with luxurious linens, Soho Home tableware as well as flowers by us. Brides had the opportunity to sample bespoke wedding cakes by Krisanthi and Preboyon, enjoy a manicure from Ned’s club spa and live entertainment by DJs Wedding Smashers. In the RWB room there was a press lunch for selected journalists and bloggers who were treated to a three course lunch by The Ned’s event chefs. For the table here we created arrangements in footed crystal cut bowls which were accompanied by clusters of smaller vases, in these we went for a dusky pink colour scheme with hints of darker pinks and burgundies. We used a selection of pink roses including Pink O’Hara, Secret Garden and Cafe Latte, deep burgundy anemones, hellebores and pale pink genesta, the delicacy of the pale pinks was off set with dark foliage. As well as enjoying a tasty lunch and glass of champagne each lucky journalist got to take home a small bouquet of flowers gifted from us. In the tapestry room we stuck to a fresh white and green colour scheme, which we know works so well here and compliments the room. The table was immaculately set for a wedding breakfast on which we nestled flowers in crystal cut bowls between the candelabras, in these we used the beautifully scented O’Hara roses and lilacs with seasonal anemones, ranunculus and hellebore whilst the scabious pods and flowering viburnum foliage added more texture. We also styled one of the original fireplaces in the Tapestry room with a beautiful installation of white and green flowers that grew and trailed over the marble. For this we used white delphiniums, tuberose and agapanthus to create height on the fireplace with clusters of roses and lilacs throughout, a variety of foliages such as olive, soft ruscus and camellia brought the installation together creating a stunning backdrop that would make for memorable photographs at any wedding. On the day there was a photoshoot for which we collaborated with La Bespoke and Studio Sorores creating a bridal bouquet that included dusky pinks and whites. The brief was for a natural, loose bouquet full of texture, using clusters of the softest pink roses, anemones and ranunculus we produced an asymmetric bouquet full of movement with addition of eucalyptus, trailing white genesta and scabious flowers and seed pods. We had such a lovely day meeting with excited Brides and the other suppliers, we are now looking forward to this years wedding season and many more beautiful weddings at The Ned. Wardrobe malfunctions, political statements and shocking celebrity feuds- the Brits stage has seen it all. From Geri Haliwell's Union Jack dress to Stormzy's poignant Grenfell Tower performance, the annual Brit Awards have for 38 years been a highly anticipated cultural event. This year was no different as celebrities and fans alike packed around the stage of the O2 arena in London to be treated to performances by Justin Timberlake, Kendrick Lamar, Dua Lipa and many more. We were absolutely thrilled to be involved in this momentous occasion by doing the flowers for the Universal after party at The Ned. Some of Britain's biggest names including Sam Smith, Ellie Goudling and Henry Holland were rubbing shoulders in belly of the breathtaking building as others danced the night away between the African Verdite columns and Mahogany tables to beats by celebrity DJ Nicholas Grimshaw. In keeping with the opulent decor, we wanted to create something truly special for the VIP guests who were welcomed to the party through a maze of tropical plants we had styled and thread pops of colourful roses into to create a magical atmosphere. This then became the perfect backdrop for a quick photo opportunity at the end of their tropical adventure before they head off to the bar. We also created a stunning 'rose garden' with over 500 secret garden, blueberry and quicksand roses which served as a backdrop for the afterparty. Congratulations to all the winners of the evening and to The Ned and Universal for throwing such an extraordinary party. Earlier this year saw the return of Kettner’s, the iconic Soho restaurant has been been relaunched by Soho House. First opened in 1867 the restaurant has a long intriguing history of feeding and entertaining iconic political and creatives figures. Soho House have used the history of Kettner’s to inspire its new menu as well the refurbished decor and artwork for the restaurant, champagne bar and its 33 bedrooms. The warm interiors and original grade II listed features of Kettner’s has been retained and updated with the signature Soho House vibe; traditional and cosy with contemporary design features. We are thrilled to be part of such a historic establishment and it’s a joy to create floral arrangements that work with the beautiful decor each week. We want the flowers to compliment the opulence and glamour of Kettner’s so roses were the obvious choice for both the champagne bar and restaurant, combining dusky, vintage colours such as Quicksand and Lovelace alongside rich velvety varieties like Black Baccara. With the roses we have been using glossy Camellia foliage which adds height and drama to the arrangements so they make a statement as you walk in to the rooms, as spring slowly arrives we will start to incorporate new foliages and elements like the peach blossom used here to reflect the changing seasons. We have styled the restaurant using a selection of plants and vintage crystal cut glass vases and decanters, the planting needed to compliment the Georgian features whilst adding interest and softening the space behind the banquettes. For this we chose a variety of ferns, variegated ivy and miniature kentia palms that create a botanical feel and will over time develop in the space, trailing and growing around the original listed mirrors and floral plasterwork. Reflecting on our 2017 weddings we’ve been incredibly lucky to work with a host of beautiful brides at some spectacular locations. All our brides have had unique ideas about their wedding flowers which has made for an exciting and varied year. From Aynhoe Park in Oxfordshire to the Ned Hotel in London, we have worked in a wide range of wedding venues throughout 2017, creating spectacular arrangements and displays for the most beautiful brides. Rebecca’s stunning floral arch in the Aynhoe Park Orangery, packed with roses ,hydrangea and delphiniums with copper accents was the perfect entrance for a spectacular bride. At the Newark Priory ruins in Surrey, our lovely bride Tiffany wanted to create a ceremony backdrop to end all backdrops. 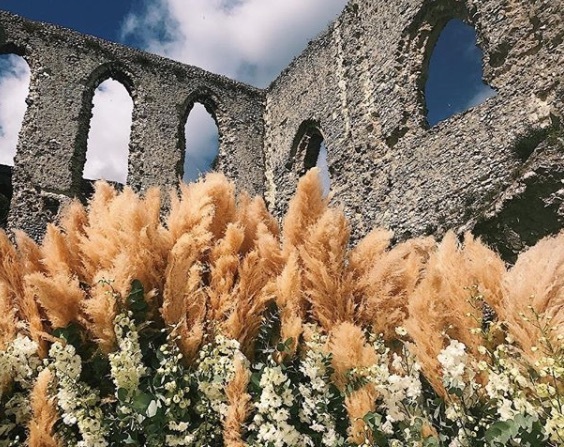 This pampas and delphinium wall added to the dramatic scene under the Priory ruins. Kim's stylish Chelsea town hall wedding was just in time for the tail end of peony season. Kim’s vibrant palette complimented her beautiful and elegant dress. Kate’s wedding at Chateau de la Bourlie in the Dordogne was breathtakingly beautiful. Kate’s picture frame styling ideas were complimented perfectly by her spring flower selection. We loved this stunning urn arrangement for Laura and Scott at The Ned hotel in London this September. The fresh and romantic palette Laura chose was ideal in the Ned's Tapestry and Saloon event rooms. We have loved creating beautiful blooms throughout 2017 for our amazing brides and can't wait to get started on more wedding design ideas for 2018. We were thrilled to take on the task of decorating the Ned this Christmas. With its already striking features and warm atmosphere, we only wanted to compliment the existing space and interiors. Taking inspiration from the original African verdite pillars and the luxe interior of the ground floor restaurant furnishings at Cecconi’s City of London and Millie’s Lounge, the 20ft Premier Nordmann Fir tree in the main hall glows. With 4,500 lights and over 900 decorations in green and gold hues, it is the perfect backdrop to get you in the Christmas spirit. The other trees around the hotel take their lead from the main tree design; we added a touch of plum red in the Tapestry room and Saloon to create a warm feel for the events taking place. The entrance garlands are filled with seasonal, natural decorations, diffusing scents of lavender and orange to those entering The Ned. In true Christmas form, our florals around the hotel comprise gold, plum and vintage tones. The Pampas grass adds height and scale, and we have used seasonal berries for texture. The Ned is the perfect setting to cosy-up for dinner, enjoy pre-Christmas drinks or have a full-blown party. We don't think there is a better location in London to get you into the festive mood. Returning to Aynhoe park to do the flowers for Rebecca and Craig’s beautiful wedding this August was an absolute treat. The backdrop and setting of this epic country manor is spectacular and was perfect for all the amazing ideas this stylish and creative couple wanted to achieve for their special day. Rebecca's vision was classic and beautiful flowers in whites and blush tones, with an accent of copper throughout. The couple wanted to create a show stopping arch for Rebecca’s grand entrance into the ceremony being held in the Orangery. The three metre high archway was packed full of hydrangea, roses, delphiniums and other seasonal flowers. Completing the look with copper sprayed leaves to tie into the overall theme. Craig also surprised his bride by asking the wonderful Bubblegum Balloons to create a fun and cool balloon installation. We selected a beautiful range of scented garden roses for her table flowers, set out in clusters of crystal cut vases with copper tea lights and flowing foliage. Rebecca absolutely stunned in her Berta dress, so we only wanted to compliment her look with a gorgeous bouquet packed full of scented garden roses and some peony roses. Rebecca and Craig's wedding was simply beautiful with impeccable attention to detail, captured perfectly by the talented Craig & Ava Sanders photography. We were delighted to work with the wonderful team at Cowshed for the launch of an exclusive collaboration with one of London’s most exciting talents, Mary Katrantzou. The award-winning designer chose four of her favourite Cowshed products (Cowshed's Knackered Cow Bath & Shower Gel and Body Lotion, Cow Pat Hand Cream and Dirty Cow Hand Wash) and reimagined them with her signature use of bold colour and intricate print. The collection also includes silk pyjamas and a range of cosmetic bags featuring the same prints. After providing the flowers for an intimate dinner held at The Ned, we worked with the team at Cowshed to create eye-catching images for the campaign. We predominantly used big blooms for impact and texture. The design of the bottles was perfect inspiration! Matching the vibrant colours of the packaging, we selected English roses with the most perfect scent, different varieties of dahlias, delphiniums and stems of flowering dill, freesia and crocosmia. Very much the best of summer. Dahlias are having a 'moment' at the minute - the variety you can get in colour, size and shape makes them perfect for creating really impactful floral design. They feature in many forms in the images - blush Cafe Au Lait dahlias which are huge (sometimes they are called dinner-plate dahlias), pom-pom dahlias in vibrant corals and orange and Withy Pitt dahlias which are grown by a specialist grower in West Sussex. These lovely products are now gracing our bathrooms at home - perfect to use after a long day of handling flowers! Spring saw the Ned turn into surely one of London's biggest displays of beautiful and rare peonies - we filled every corner with different, and difficult-to-find, varieties. From luxurious velvet red peonies in Lutyen's Grill and Ned's Club to huge crimson varieties in Cowshed and brighter lemon varieties in Barber and Parlour. We even sourced some scented tree peonies for the new Trish McEvoy Powder Room - these were perfection. Sadly the peony season has ended for another year, but we are embracing the change in season and the chance to fill the Ned with the best of summer. Arrangements containing lovely hydrangea and roses, coupled with fresh summer foliage, are currently enjoying their tenure at the Ned. And, in the lobby, pampas grass has made way for peach and golden eremurus and the finest orchids for the added 'wow' factor. We are also loving the weekly tropical arrangements for Kaia, filled with exotic leaves and orchids. The Ned is a visionary (and sensory) overload and a creative's dream. If you haven't been yet, our advice is to book now! Since its opening in April, its been a whirlwind ride for us with the Ned. Not just for the beautiful blooms we've been installing each week but for the incredible events happening each day. We have been lucky enough to help style, decorate and 'fill with flowers' some of the best event spaces we have seen in London. The Saloon (our secret favourite) is a romantic, opulent and stylish ballroom that would be the best backdrop to any London wedding, dinner or party. Our most recent event there, we worked with the incredible Jodie, who allowed us to decorate the gigantic, ornate mantlepiece and pack the long dining table full of Peonies, Dahlias, Hellebores and Sweet William's in bold and dark colours. Setting the perfect scene for this social media lunch. It's only on the rare occasion that Lil and I are left 'speechless' but the first time we entered the Ned......we didn't say much. On discovering The Tapestry room on the event floor we couldn't believe the scale and grandeur of this space. The original tapestry is one of the largest of its kind. There are 4 impressive fireplaces and the dark wooden panels create an authentic and traditional feel. The amazing chandeliers are beautifully restored and set off the tone for any event. We recently styled The Tapestry room for a shoot. Using whites and greens to create a fresh look to compliment the room. We used hydrangeas, peonies and sweet peas in stone urns as low feature centrepieces. We decorated each mantlepiece with central pampas grass arrangements and dramatic white leaf arrangements for the fireplaces. We are delighted to announce that we will be working with The NED, London's most exciting new hotel opening, as the official contract florists. The Ned hotel, situated in the heart of the city is a truly unique space featuring some of the most incredible features and architecture, that has been brought back to life by the incredible Soho House and Sydell Group. Every last detail has been carefully considered and the building has been perfectly restored to create a sophisticated, grand and cool space. Situated in the old Midland bank building it boasts, 7 restaurants, 250 stunning bedrooms, 2 swimming pools, private members club, gym & spa. The sun drenched roof terrace has one of London's best views and the event spaces for hire are the perfect London wedding venue or private dinner party spot. For the florals we want to help create drama and scale with large and impactful displays for guests entering the hotel and use luxurious and rich roses to enhance the member spaces and relaxed arrangements for the spa and chill out areas. If you haven't seen the space already, our advice is...............................don't wait!! Building our beautiful indoor secret garden at the Quintessentially Wedding Atelier was so much fun with our amazing team. We wanted to create the perfect wedding flower scene using the finest seasonal flowers. The Langham hotel (a beautiful London wedding venue) was the perfect backdrop to our set, that included 2 10 ft trees, a growing staircase garden and a floral bench to set the scene. Using scented roses, delphiniums, hydrangea, cheery blossom and lots of other beautiful seasonal flowers and foliage. We met some lovely brides planning their special days and felt inspired by the other exhibitors. Especially the amazing Ricky Paul! Wow.